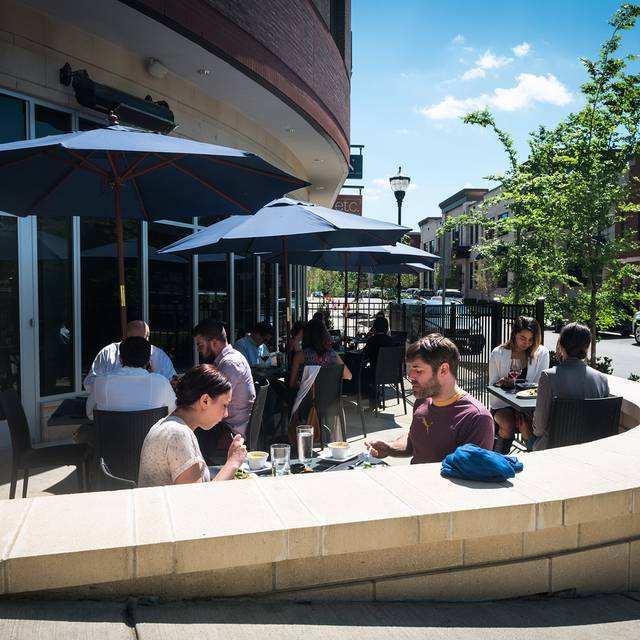 You must make reservations at least 5 minutes in advance of the time at etc..
We offer complimentary valet parking in addition to limited spots in the parking lot directly behind the restaurant. Street parking is also available. etc. is the newest venture for Chef/Owner Deb Paquette. Located in the Bedford Commons complex of the Green Hills neighborhood, etc. offers lunch & dinner Monday - Friday, dinner on Saturday and Sunday brunch. As the second, smaller version of sister restaurant Etch, Deb incorporates her favorite spices, produce and global recipes on the menus at etc. for an adventurous dining experience. A succinct wine and cocktail menu includes wines from around the world, select craft beer and a handful of culinary-minded cocktails. The intimate 2400sq ft space features simply adorned tables, comfortable banquette seating, a large wine and cocktail bar and plenty of open-air seating. 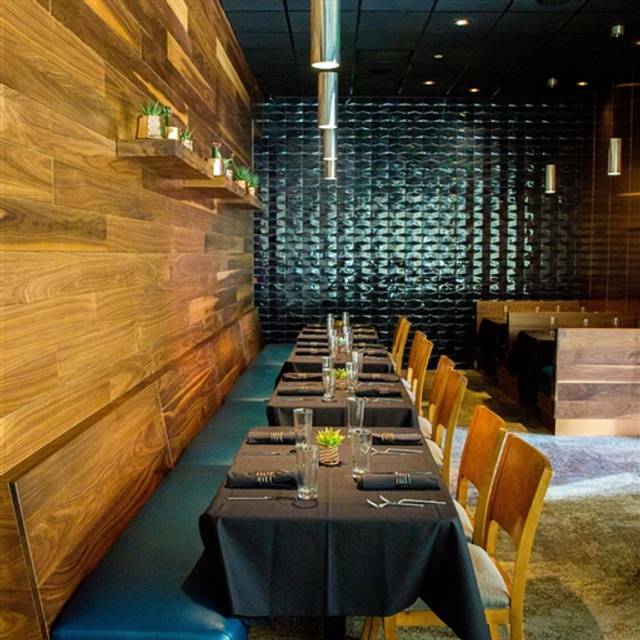 Funky light fixtures, striking electric blue, copper and glass accents, and warm woods fill out the intimate space. Treat mom to brunch or dinner this Mother's Day! 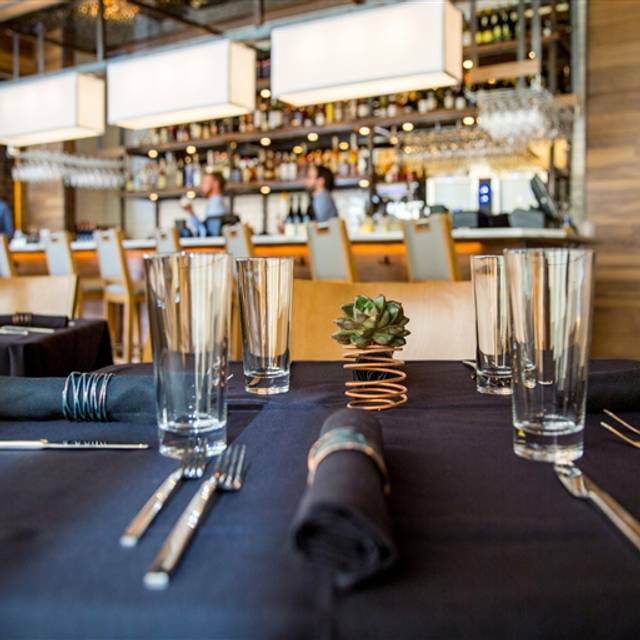 We'll be open extended hours to accommodate all of your family's celebrations. Join us for brunch from 10am-3pm, then for a special dinner service from 4pm-8pm. Full menus will be available in addition to a selection of Chef's features. Spend this Easter with Deb and the rest of us! We'll be serving our full brunch menu from 10am-2pm along with a selection of Chef features. One of the best lunches in town. It’s SOOO cheap I order extra food just so I can leave a better tip. Sandwiches are full of flavor and on great bread. Went out for a girls' dinner and really enjoyed it. I had the scallops and it was delicious. 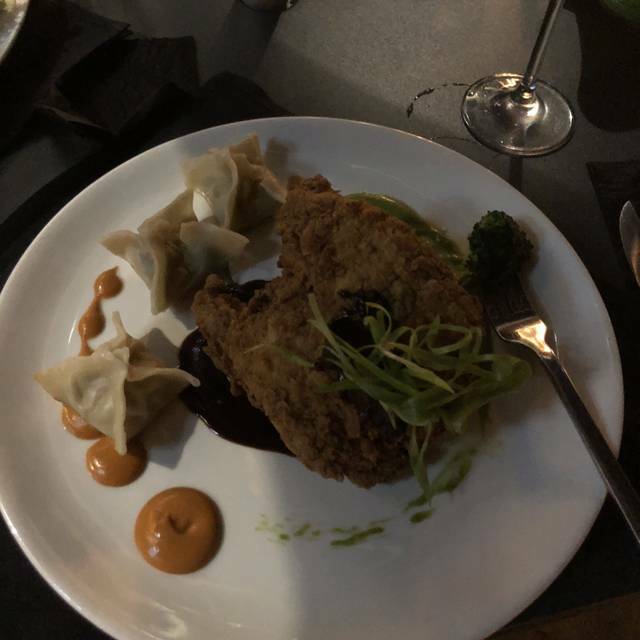 One of my friends ordered the pork dish and it was very good. The wine selection was great and the service was top notch. I hope etc. remains in Green Hills for a long time to come. We certainly need restaurants of its caliber here. Hi Casey, thank you for taking the time to share your experience! It sounds like a fun girls' night out was enjoyed by you and your guests. We appreciate your patronage and look forward to seeing you back again soon! We enjoyed our brunch at etc. Wonderful service, good food, nice atmosphere, and good mimosas, too. I look forward to dining here again. Thank you for the review, Rebecca! We're thrilled to hear that you enjoyed your brunch visit at etc. Please come back and see us for another mimosa soon! Etc. was extraordinarily amazing. Cuisine was fresh and interesting, both in texture and taste. Service was impeccable. Can’t wait to return. We're delighted to hear that your recent visit to etc. was five-star worthy! Thank you for taking the time to share your feedback. We hope you'll return again soon! I love this restaurant. The food is clean and delicious, very creative, and the service is professional and charming. Most of all the place is quiet and not designed to be loud. I just love it; thank you Etc. Thank you Deb. Thank you for your kind words! We're delighted to hear that your visits to etc. are always relaxing and enjoyable. We appreciate your patronage and look forward to seeing you back again in the near future! Love everything about it. Chef Debbie is AMAZINGLY creative and talented. Our server made us feel VIPs! Absolutely delicious . . . duck confit quesadillas were supreme. We will be back! Thank you for the review! It's a pleasure to hear that you enjoyed the BBQ Confit Duck Quesadillas. They're one of our most popular lunch entrees! We hope you'll return to dine with us again soon! The experience at etc. was wonderful. It began with the (Manager?) Bret, solving a problem I was having with an e-Gift Card from 2018! He solved it-issued a new one and all was right! Relief! The location and environment within etc. was perfect for the morning Brunch. The staff was great, the valet was great and the server was exceptional. The beverages and meal were superb. This was not the average "brunch" meal. Thank you. This is a new favorite! Deb P has perfect vision and taste (for me). Thank you. Hi Melinda, thank you for the five stars! We're pleased to hear we could successfully rectify the gift card issue during your recent visit to etc. It's always wonderful to know that both food and service were so memorable. We appreciate your patronage and look forward to seeing you back again soon! It’s totally subjective, but the restaurant lacked “color”. I felt the energy of the place was visually low. However, the food was very good and the staff very friendly. 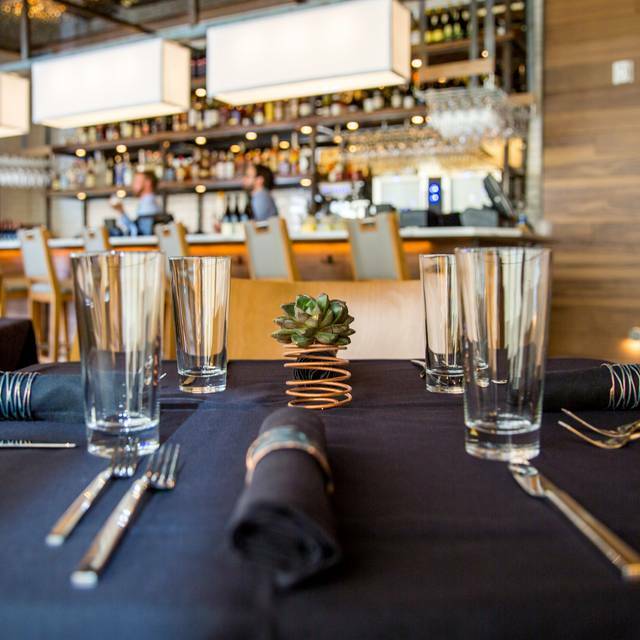 etc is a great place for an intimate dinner. The menu is creative and delicious. Their wine list has great variety by the bottle or glass. We ate the octopus and salmon appetizers. Both were as good as they were different. I had the venison plate, which was beautifully prepared and presented, accompanied by a glass of Latour burgundy. My wife ordered the chicken cassoulet. it too was well prepared and delicious with a glass of french chardonnay. Our waiter, Michael, was there when we needed him and never hovered. A great meal! Thank you for the feedback! It's wonderful to know that your dinner was enjoyed from beginning to end. We'll be sure to pass along your praises to Michael as well! We hope you'll return to etc. again soon! Celebrated husbands birthday and we thoroughly enjoyed the quiet atmosphere and beautiful presentation of food. And of course food was yummy. Nice touch on delivering husbands dessert with a candle and happy birthday message. Hi Kelly, thank you for the review! We appreciate you choosing to celebrate your husband's special day at etc. 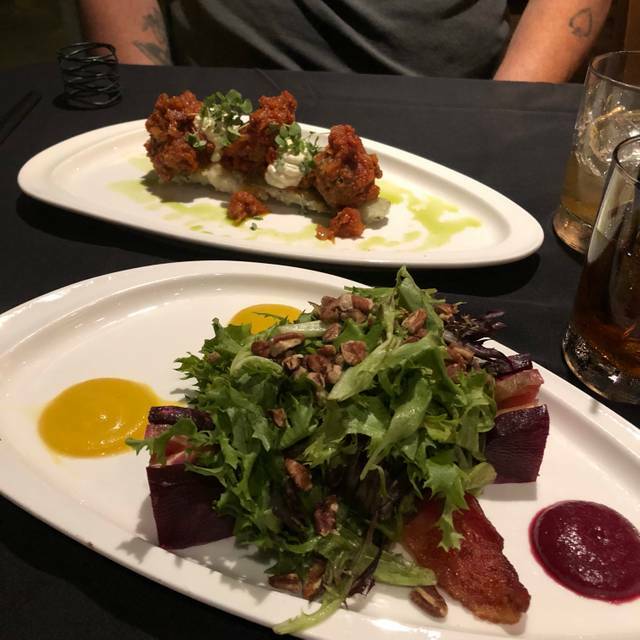 It's wonderful to learn that both food and service were enjoyed during your visit. Thanks again for taking the time to share your experience; we look forward to seeing you both back again soon! Thank you for your kind words, Craig! We hope you'll return again soon! Beet and kale salads were fresh and flavorful. My wife and I both had filet which was tender and served with an array of sauces and sides - non-traditional and tasty. The tangerine / panna cotta desert was light and gone too soon! Thank you for the review, Thomas! It sounds like you and your wife enjoyed a lovely evening at etc. We appreciate your feedback and hope you'll return for dessert again soon! Our dinners were excellent, and I feel that we received our money's worth. The noise level was better than most restaurants, but it was still difficult to hear my friend across the table. Food was delicious and different..waiter was fantastic! As usual dinner at Etc. was delicious. The service was great. The wine list was varied and offered several options to coordinate with dinner. We highly recommend Etc. Thank you for the recommendation! It's wonderful to learn that your recent visit to etc. was worthy of five stars. We hope you'll return again in the near future! Food and waiter were fantastic. Hostess was snotty when I indicated that I didn’t want to sit in the middle of dining room bc of noise. There were many tables open so I’m not sure why it would’ve bothered her. I am sorry to hear that some elements of your experience fell short of expectations. We strive to provide seamless service from start to finish, though it sounds as if we came up short here. I sincerely apologize for how this affected your meal with us, and have shared your feedback with our team for review. 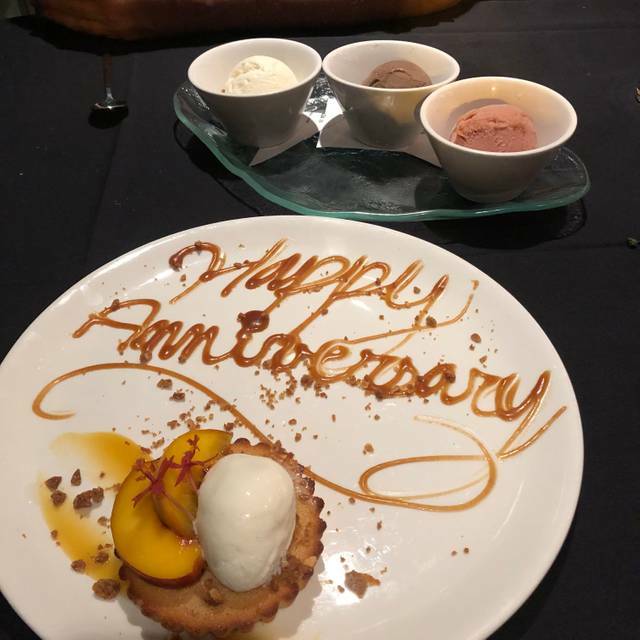 We appreciate your patronage and feedback, and hope that you will return soon to experience the level of quality service and cuisine we are fully capable of providing. We had a group of 6 for "Girls Night Out." Etc. was the perfect restaurant for us. The food is always amazing and creative (carrot tartare . . . WHAT?!? . . . yummy!). The service was impeccable. The cocktails were unique and well-crafted. We were the noise level (oops!) but the staff wisely placed us out of the way to protect the other guests. The masterful Chef, Deb Paquette, stopped by our table and chatted with us for a minute. It was a wonderful evening. Thank you for the lovely review, Cindy! We appreciate you choosing to join us for Girls' Night Out. It sounds like a fun evening was had by all! Please come back and see us again soon! ETC., like ETCH, is adventuresome in its combinations and flavor profiles in the best, controlled way. The room is small and intimate and acoustics seem to be better at ETC. The actual site is a little strange- nested in between strip malls and new, generic mixed-use residential development. ETC is in the latter. Due to the location, this is definitely not a place I would have tried randomly. We went because we are fans of ETCH and live in close proximity. The food: The octopus (like ETCH) is amazingly tender and delicious. This is a place where the steak is actually really good even though it’s definitely the “safe” choice on the menu. The special last time was a fish dish- it was very fresh and paired with a seemingly complicated grouping of veggies that complemented the fish without overpowering it. My husband got the venison which made for an unexpectedly great meal. I should also mention the bartender was knowledgeable about wines and made great cocktails. Thank you for the review, Michele! It's wonderful to know that you and your husband enjoyed your recent visit to etc. We appreciate your patronage and hope to see you back again in the near future! This was for my husband’s 45th birthday. He has always been a fan of executive chef, Deb. 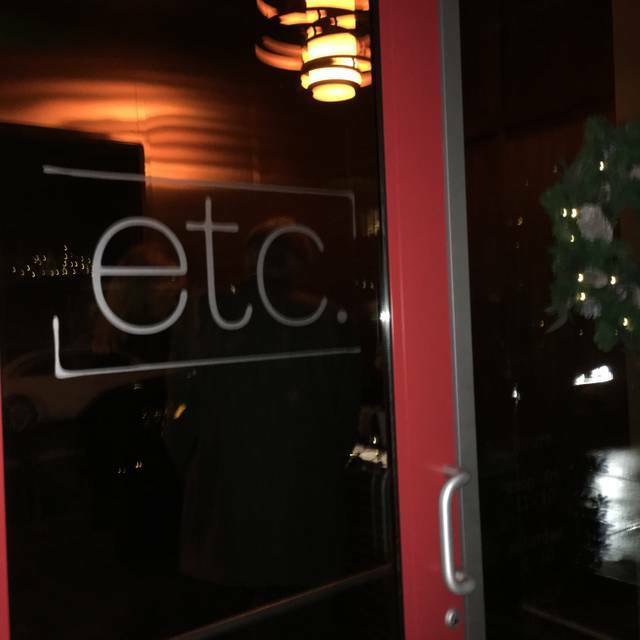 One of his all-time favorite restaurants is Etch, so naturally, we had to try Etc. Deb came out and spoke with us for 15 to 20 minutes. It absolutely meant the world to him. Deb is a true artist. There was NOTHING I would change from the cocktails, to the salads, apps, entrees, and dessert. Sublime! Thank you for the lovely review! We appreciate you choosing to celebrate your husband's special day at etc. It sounds like a fun evening was had! We look forward to seeing you both back again soon! Went for the mid-day menu and happy hour. Chicken salad and roast beef were fantastic, and serving size was big enough to leave us sated, and not so much that we felt stuffed. Celina gave great service at the bar and answered all our questions. We'll be back! Thank you for the review! It's a pleasure to hear that both food and service were enjoyed during your recent visit to etc. We'll be sure to share your kind words with Celina! We look forward to your next visit soon! Always an excellent menu and presentation. never disappoints! Absolutely Delicious!! A no rush "ladies lunch"
Excellent Service, Food and Details!! Thank you for your feedback! It's a pleasure to hear that you and your guests enjoyed your ladies' lunch at etc. We hope you'll join us again soon! Thank you for joining us for Sunday brunch. I sincerely apologize for the delays in service you experienced, and for the noise distractions coming from our kitchen. Given the small size of our restaurant, that is something we need to be more cognizant of; I sincerely apologize for overlooking this during service on Sunday. We'd love to speak with you further regarding your experience. Would you mind sharing your contact information with us at your convenience? Thank you in advance for your time! Food was amazing and well presented. Wine pairing was well done. We had a great waiter named Herman who did a phenomenal job taking care of us but was not annoying by interrupting us all the time. Thank you for your feedback! We're delighted to hear that Herman provided a memorable dining experience for you and your guests. We look forward to seeing you again in the near future! Hi William, thank you for the kudos! We appreciate your patronage and will be sure to share your praises with Deb. Please come back and see us again soon! ETC never disappoints. The food is delicious and the presentation is beautiful! Thank you for your kind words! It's a pleasure to hear that your visits to etc. always exceed expectations. We appreciate your review and look forward to seeing you back again soon! 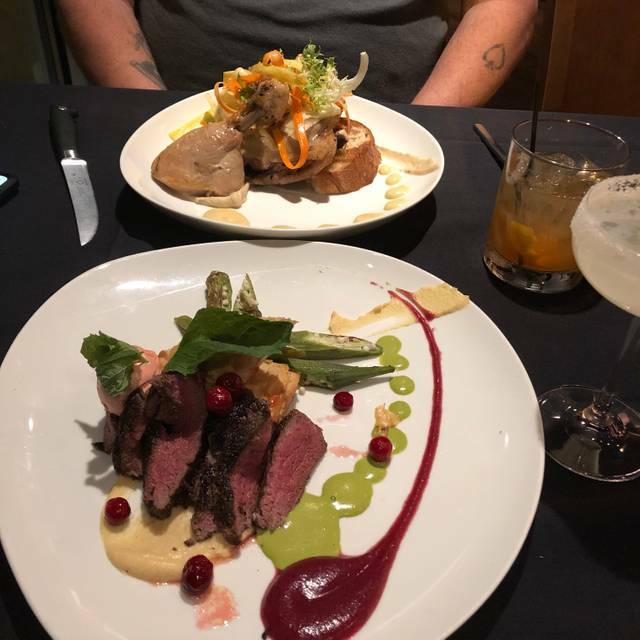 Fantastic meal and service! Our server Elliott had the perfect amount of attentiveness. We look forward to coming back. Thank you for the review! It's wonderful to hear that Elliott provided such exemplary service during your recent visit to etc. We will be sure to share your kudos with him! Please come back and see us again soon! It's a pleasure to hear that Elliott helped to make your recent visit to etc. a memorable one. We appreciate your feedback and hope to see you again in the near future! Patty melt ordered medium rare, arrive rare/red and cold inside. Hi Laurie, I'm so sorry to hear about your recent lunch experience with us! It sounds as though you did not receive the level of quality service and cuisine that we are proud to provide our guests with, and I regret how this affected your meal. We'd love to speak with you to determine when you dined with us; would you mind sharing your contact information with us at your convenience? Thank you! Ect. has a small and intimate feel and food is always beautiful. Nashville is a city full of great restaurants with great chefs and Etc. is one of my very favorites! The food is so special here...creative, beautifully executed. But what a value! Who would expect such a great value priced menu for such exceptional food, setting and service in Green Hills?! I can't recommend it enough. Thank you for the recommendation, Karen! It's wonderful to hear that Deb's culinary creations are always so memorable. We appreciate your feedback and look forward to seeing you again in the near future! The service and atmosphere were excellent. The food always is an interesting mix. Excellent overall experience! Thank you for the review, Jon! We're delighted to hear that your visits to etc. are always enjoyed. We appreciate your patronage and hope you'll return again soon! See Full Restaurant ListMake a Reservation at etc.